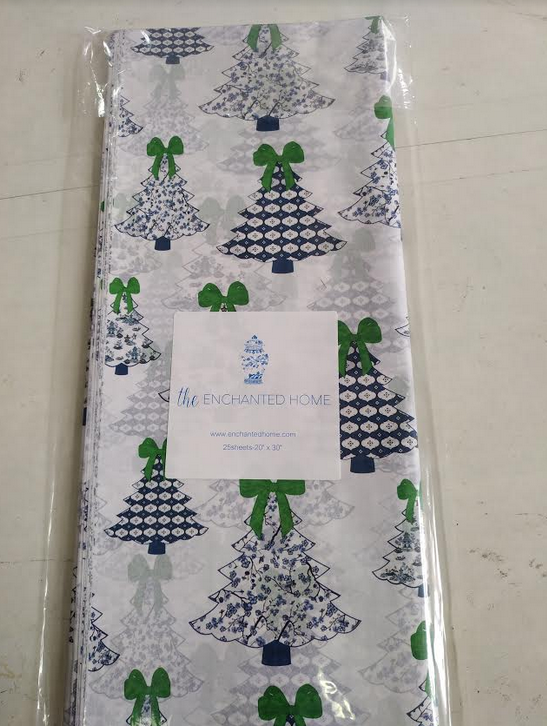 The much anticipiated 2018 holiday giftwrap sale is on plus a giveaway!! Hello! 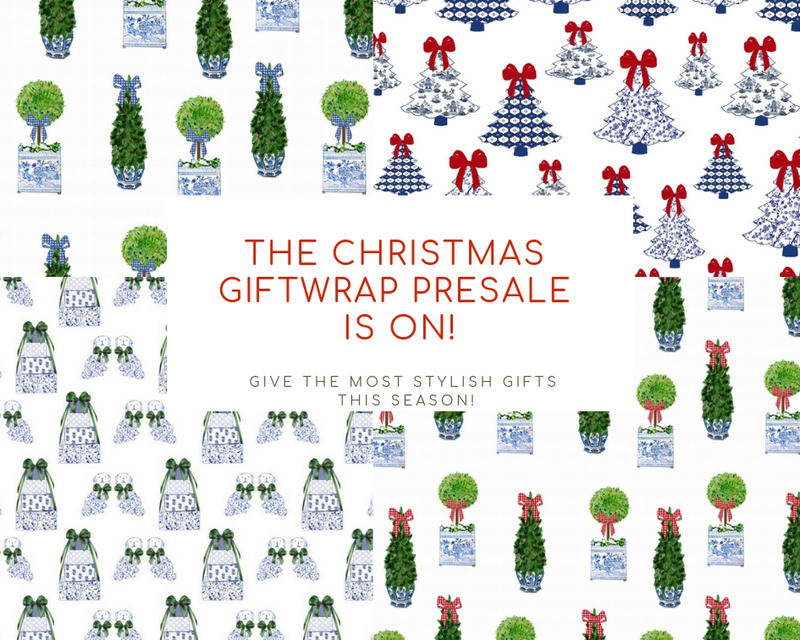 Take a seat friends because as of 9am this morning, our holiday gift wrap is finally up for presale! Lots of of you have been patiently waiting and believe me, no one wanted this to be out of production and en route more than I did and it’s on its way! We are really excited about our gorgeous new styles that have been in the works for quite some time. As we always do we offer you, our Enchanted Home readers “first dibs” via a presale with special pricing. Any purchase over $300 gets two free rolls of their choice! ITEM 1. NEW STYLE! 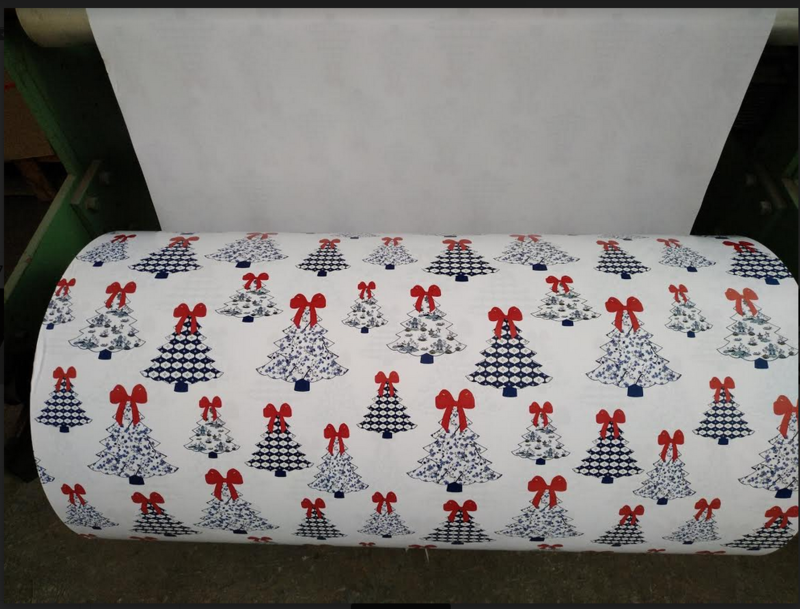 Our beautiful Christmas trees, love this pattern with three different blue and white patterned Christmas trees adorned with a beautiful red bow. Talk about a way to wow your gift recipients! What recipient wouldn’t be thrilled to get a gift wrapped in these beautiful papers. ITEM 2. NEW STYLE! 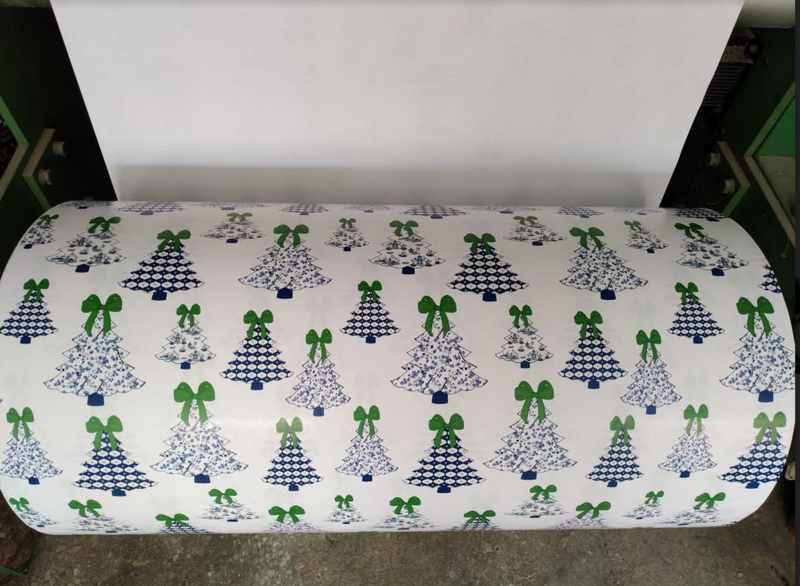 Our beautiful Christmas trees with a big mossy green bow, love this pattern with three differnt blue and white patterned Christmas trees adorned with an elegant mossy green bow. Who wouldn’t be thrilled to get a gift wrapped in these beautiful papers. ITEM 3. NEW STYLE! Our fabulous new topiary paper featuring two types of boxwoods in gorgeous blue/white planters is going to be a instant classic! What a gorgeous gift this will make! ITEM 4. NEW STYLE! Our stunning topiary paper featuring two types of boxwoods in gorgeous blue/white planters is going to be a classic! This one comes with the blue and white gingham box. What gift will not be even more beautiful when wrapped up in this fabulous paper. ITEM 7. Tissue paper in EVERY pattern! This year we are offering tissue in every pattern, all tissue packs come with 25 packs of oversized tissues sheets that measure 20″ x 30″. By popular demand we are now offering beautiful ribbons that are affordable and the perfect finishing touch for gifts using our papers. Ribbons can only be purchased with the purchase of giftwrap. These are the perfect match for the beautiful papers to create a picture perfect gift! 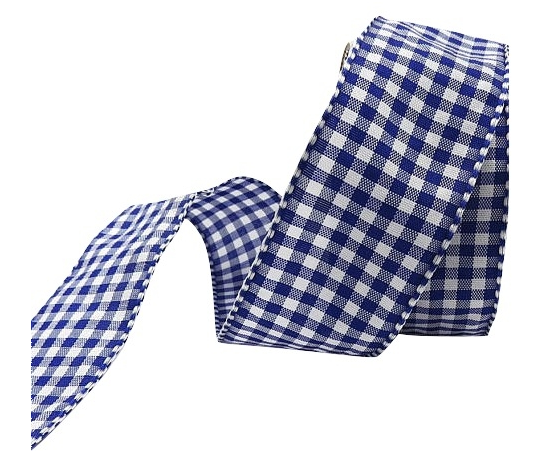 Our gingham ribbon is always a big hit! ITEM 9 . So happy to introduce to you this year this gorgeous high quality double faced satin ribbon. Such an elegant way to wrap a gift, this beautiful 1.5″ satin ribbon in extra large rolls are the prefect coordinates to all the giftwrap above. Offered in four colors- red, gold, navy and moss green. ITEM 10. Gift toppers. Back by popular demand. Nothing can finish off a gift quite like these gift toppers. 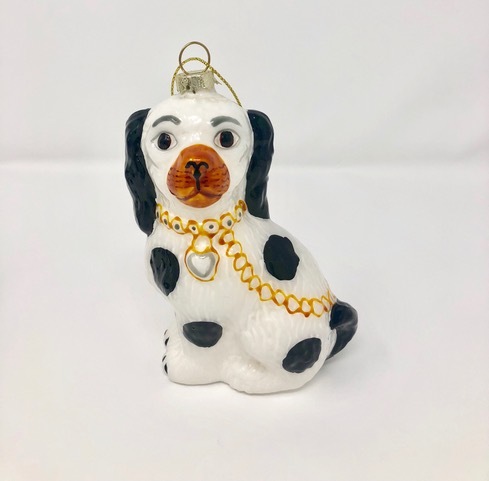 They measure 3″ and the beauty is they are an ornament so once the gift is opened, your recipient has a darling ornament to add to their tree or wherever they desire. These are the perfect finishing touch to any gift year round. Now offered in 3 fabulous styles! Here are some gift wrapping ideas using the toppers from last year, love also adding a fresh sprig of boxwood, evergreen…whatever you find in your yard! 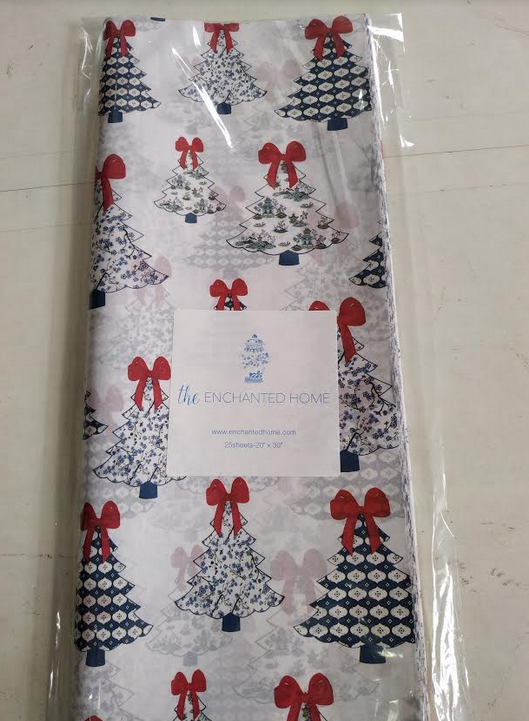 And the gorgeous tissue which is going to make opening a gift a gift in itself this this holiday season! 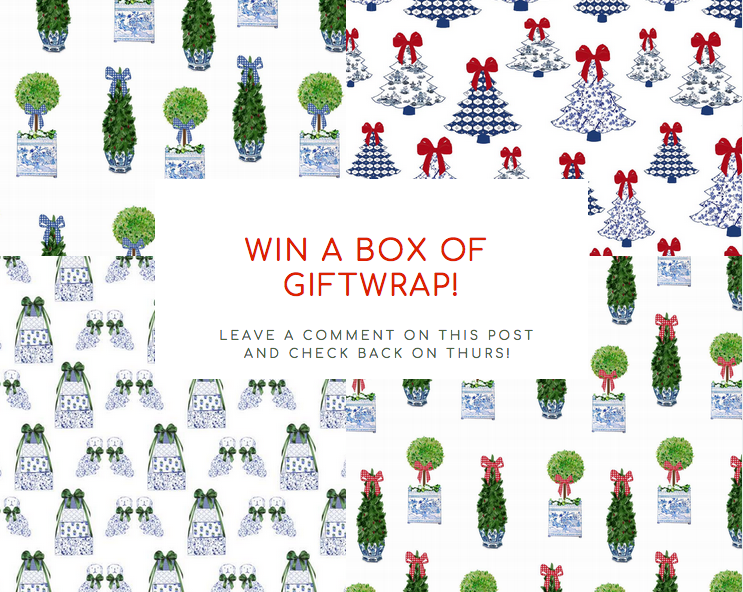 One lucky winner will win four rolls of giftwrap (assorted box of current styles either from our every day or holiday collection). Just leave a comment here telling us your favorite patterns and you will be in the running. Will announce a winner on Thursday so be sure to check back! Well if this doesn’t get you incredibly excited about the holidays, not sure what will! This has me dreaming of all the beautiful gift wrapping possibilities this holiday season…..cannot wait. This, with the ornaments coming in is sure to guarantee one beautiful holiday and your gift wrapping presentation will be the talk of the town:) Thanks for stopping in, wishing you a fabulous day. Absolutely the most beautiful gift wrap I have ever seen! How to choose a favorite? After going back and forth I would choose the Christmas trees with the green bows. Personally I love the blue & green topiaries, but I know my family will want the red & green topiaries. Love all your new papers. Hard to pick a favorite. The paper with the Staffordshire dogs is my favorite. As the owner of two adorable Cavalier King Charles Spaniels, what other choice could I make! But I love every single design! Love the green topiary with red/white gingham ribbon! I love every pattern! Love the tissue paper because that will make a gift extra special! 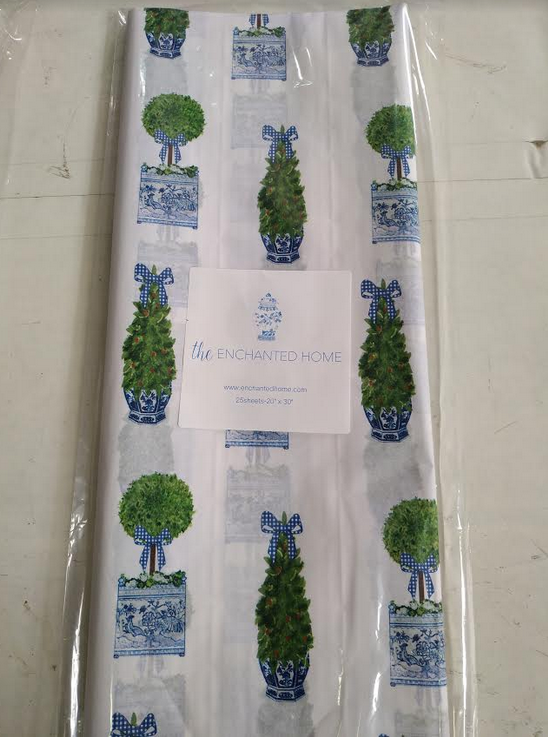 ITEM 7C Topiaries with blue/white gingham is my favorite with the blue and white gingham ribbon! Absolutely LOVE the matching toppers!!! Absolutely beautiful! These take gift wrapping to a whole new level! I know the red is more “Christmas” but these blues and greens are so attractive, yet still convey the holiday feeling. The topiary paper is so classic! Love it! My fav is the Christmas trees with green bows but they’re all delightful!! This is a beautiful line of Christmas papers, tissue, ribbons and toppers. The prettiest I’ve ever seen! Tina, they are all beautiful but my fav is the topiaries with the red & white gingham. Terrific. I’m getting ready to order #5 Staffonshire Dogs, saw your beautiful ad in Atlanta Homes! All of your papers, tissue and ribbons are wonderful. However, my first choice would be the topiaries with with the red and white gingham ribbon. Christmas Chic! That’s what this giftwrap and tissue paper is made of ! I love the blue and green topiaries, but I admit I had to scroll back and forth several times before I could settle on just one favorite! Would love to buy a gift for everyone I know just so I could use every pattern! Gorgeous! #6 is so vibrant. The blues, greens and and reds really pop on the white background. Item 6 is my favorite due to the use of all colors- red, green, blue and white. I love love the staffordshire dog paper and matching tissue paper and those adorable toppers! Loving the toparies with the blue and white checked ribbon. I would have to have the checked blue and white ribbon also. They all are so great especially when an ornament in the ribbon. The assortment , is classy and timeless. Hard to choose! Beyond Beautiful describes the paper, tissue, ribbon and gift toppers. All of these are gifts within themselves…. congratulations on the beautiful designs. This is the cutest gift wrap ever!!! I can just see a stack of boxes wrapped up under my tree. Can’t wait to use it!!! OH MY! HOW EXCITING!!!!! THE HOLIDAY’S ARE ALMOST HERE, CAN’T WAIT, BEAUTIFUL WRAPPINGS, RIBBONS AND BOWS. WHICH ONE TO CHOOSE. I WANT THEM ALL!!!!! Beautiful! I love them all and can’t wait to start wrapping!!! Love the patterns and the tissue, ribbons and toppers make such a lovely presentation. I love the new gift wrap and coordinating satin ribbon. didn’t realize you also had the tissue! Love that too!! All of these are beyond wonderful!! 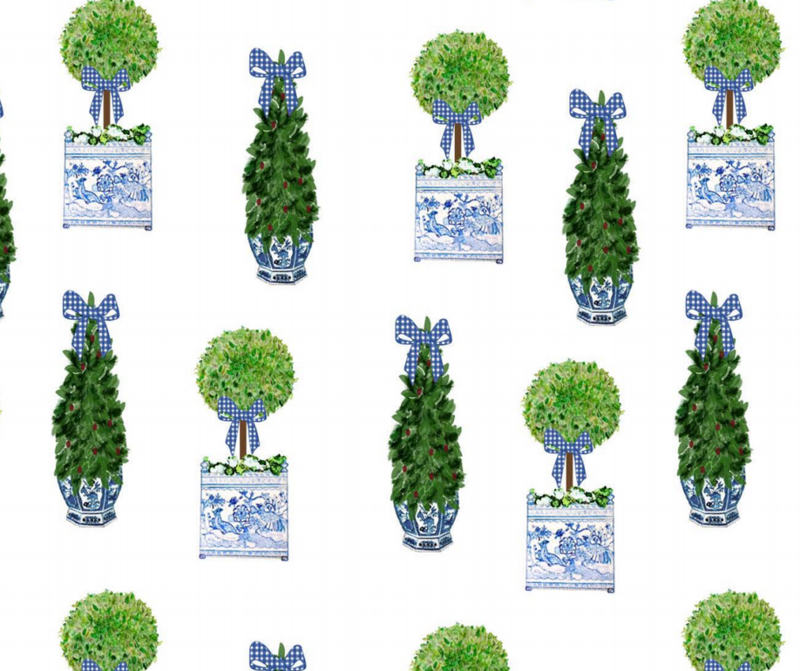 Item 4- The topiary & boxwoods in blue & white planters w/ blue bows is my personal favorite! Absolutely adorable, and am IN LOVE with the tissue paper!! #5 the Christmas topiary pattern is my favorite! 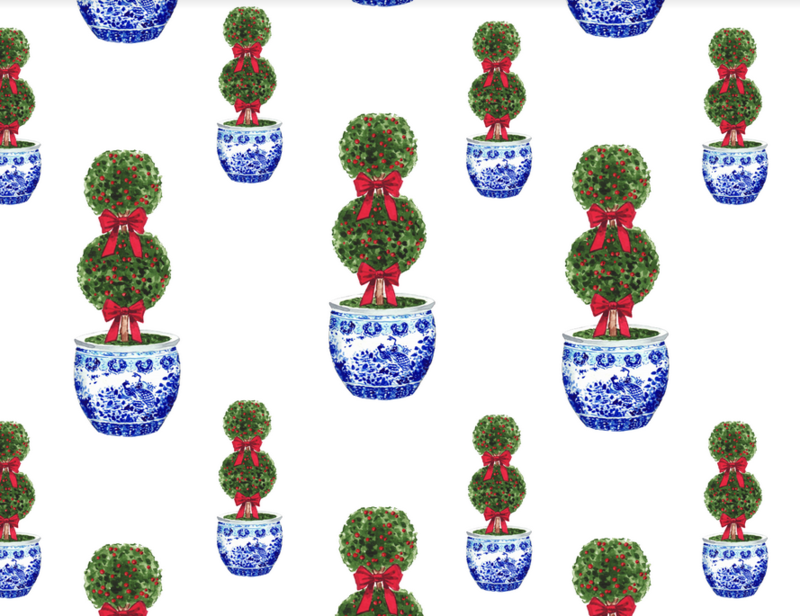 I LOVE, LOVE, LOVE, the new red and blue topiary patterns with gingham ribbons. What a fabulous way to make a statement with your gift giving – especially with the coordinating tissue and ribbon. I am going to be the hit of our family gift exchange this year! Love, love love the tissue paper with the blue gingham ribbon! So gorgeous! Thank you for offering! I love the blue and white trees with the green bows…but they are all beautiful! These are all so beautiful. It’s really hard to choose. My favorites are #3,4,6. I adore the Topiaries with the red ribbon but feel I couldn’t go wrong with any of these beautiful papers/tissues. The ribbons are lush! I am having a tough time trying to decide which ones to purchase…….I’d even like to give them away as gifts to friends that I know would love them. That satin ribbon is so special and really adds a sophisticated touch! My favorite pattern is the topiaries with red and white. I love anything and everything ginger jar! 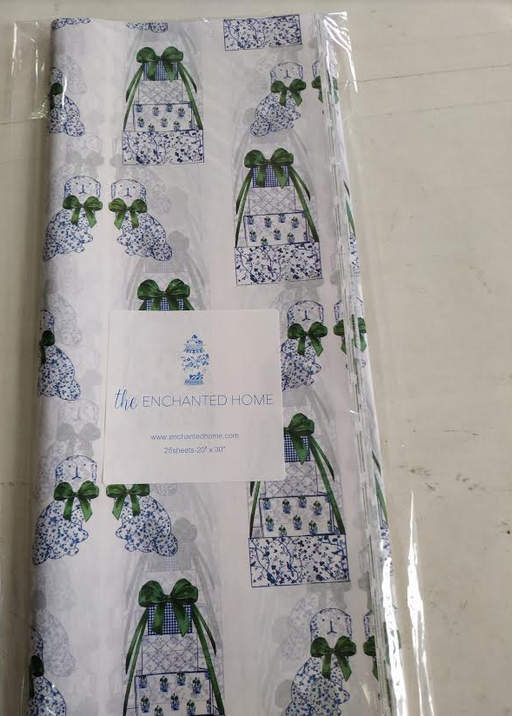 This gift wrap certainly gets me in the mood to start shopping! Can’t wait to to get my order and wrap away! 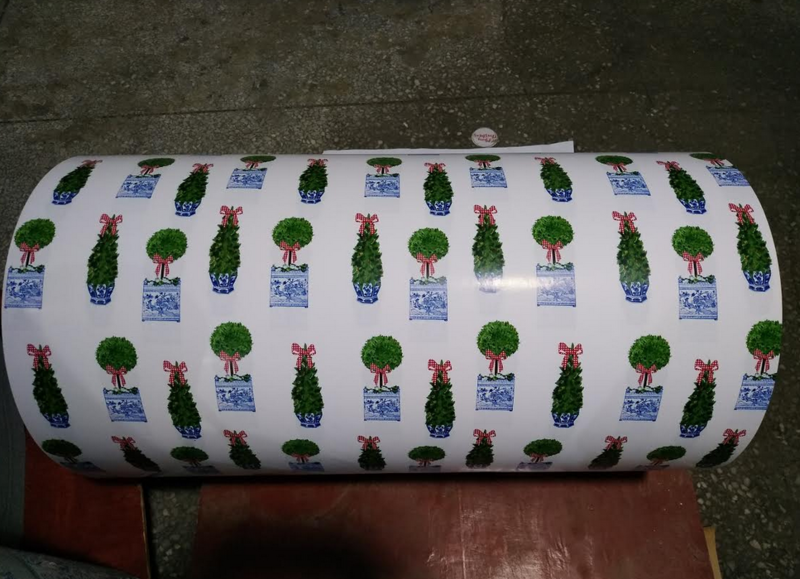 Love love love the new wrapping paper with the Christmas trees!! It’s so perfect for the holidays, I can’t wait to place an order! It’s impossible to choose a favorite because they are all beautiful. And the coordinating tissue paper would make a gift seem extra special. So happy to see the ribbon!! I will definitely be ordering everything that has a topiary on it! Thanks, Tina!! I love them all! But if I have to pick just one it would be the blue topiary with the blue gingham ribbon. So many beautiful designs. Wish I had a huge family. I would buy all of them! I simply love the English topiaries with red bows. It says “Merry Christmas” to me in a very stylish way. Beautifully done, Tina! And the ribbon selections- just WOW! My first job, at age 15, was as a holiday gift wrapper at a department store. It was at that point that I became hooked on wrapping and presenting beautiful gifts. Your collection is gorgeous, and I’ve never been more excited about the holidays approaching! I can’t wait to receive my order. #6. The all time favorite! All beautiful! Like the staffordshire dog paper! So different and great for dog lovers! Thanks for the giveaway! Very generous! Love Topiary boxwood and the dogs and presents. In blue and white of course! The Stanford shire dogs & presents and topiaries w blue gingham are awesome. Beautiful, fun, creative way to start a B&W holiday tradition! The Staffordshire dogs & presents and topiaries w blue gingham are awesome. The gift wrap, Ideally, I like them all. They are really unique. Especially love the fact you also have the tissue paper to match. Beautiful presentation! House warming gifts wrapped in these papers, holiday hostess gifts wrapped in these papers and Santa gifts wrapped in these papers, a lovely display! The wrapping paper is beautiful! The choices this year are amazing. My favorite is the green/blue topiary paper! Oh my goodness! So many pretty papers! And the ribbon, toppers and tissue paper! WOW! I am ordering today! I absolutely love the gift wrap and matching tissue paper!! Love item 3… Two types of boxwood with a touch of holiday red! You make the presentation so elegant. Since I have the blue gingham ribbon from previous order my favorite paper is the topiaries with that bow. Also love the matching tissue paper. My favorite pattern is the blue and green topiaries, although ALL of them are gorgeous! You’re putting me in the holiday mood!! Want one of everything! I especially love the Christmas tree with green bow, boxwood topiaries, and Staffordshire dogs/presents! #1 & #6 are my favs! I love it all! I’m going to use the topper on my smaller trees i use in the deep window sills in my dining room! You’ve outdone yourself with these fantastic new designs … certainly to make any Christmas package, Merry!!! Can’t wait to see them in person!! I am such a gift wrap junkie, people actually ask me to wrap gifts for them and I’m happy to oblige in order to use up what I have to buy more! I love the topiaries with green ribbons the best, but there’s not a single pattern I wouldn’t want! Fabulous. Love the gorgeous topiary wrapping paper, tissue, ribbons, and the cute toppers! Love every bit of it!! Can’t wait to create beautiful packages with it for all of my loved ones! The gift toppers + ribbon + paper = perfection! Loving all the new gift wrapping patterns !! Can’t wait to order ! bought this for my granddaughter who is in college and majoring in marketing. 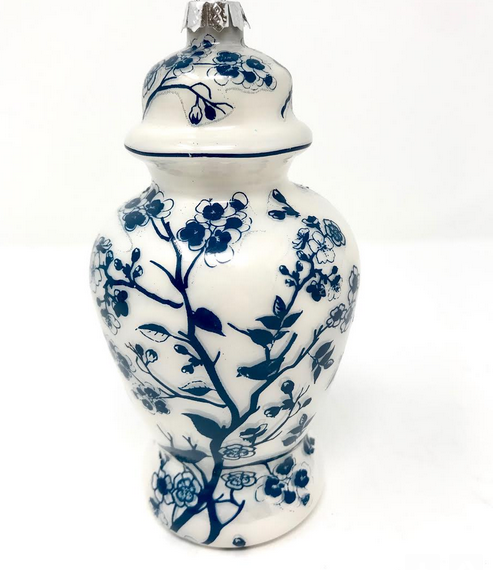 She loves the blue and white and has started a collection in her dorm room. She will love love love this! Love y’all he trees with green bows! Absolutely love them all! I will buy more gifts just to wrap them! It’s a hard decision. After flipping a coin, I’m going with topiaries with red and green bows. So hard to pick one …. the topiary with the gingham ribbon is my favorite. The whole collection is exquisite, congrats Tina! Christmas trees with green ribbons!! 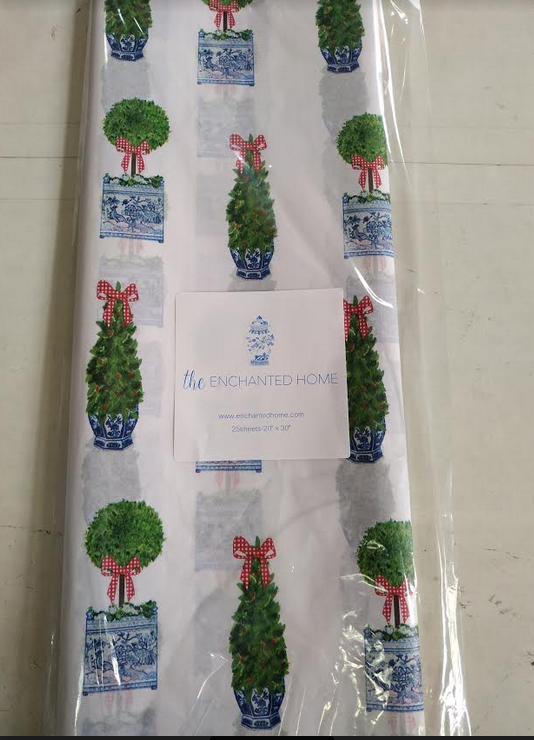 The giftwrap is fabulous,love the topiaries! Topiary!! Those red bows are precious! I love the red ribboned topiary paper and tissue. I have ordered the gift toppers as well! Thank you for bringing us such lovely paper goods. Too many choices!! Christmas trees with bows are my FAVORITE!! Love all of these – hard to pick a favorite. Think #1 is it. These are so beautiful, whimsical and unique, Tina! I am stocking up and am so excited to not have to go out searching for something special to wrap our gifts with this year. I find the topiary and trees with the green ribbon to be most eye catching, but the Staffordshire dogs and gifts has really captured my hearts. LOVE the matching tissue and beautiful double sided ribbon! Thank you Tina!! They are all wonderful especially the Staffordshire dogs and presents! I would use the topiary with blue ribbon tissue paper year round! All of your ribbon is amazing too. Actually, I am crazy over all of it. Love them all! Just beautiful! I have two. Item 6, and item 7c. Love both! Happy holidays! These are all so lovely! I’ve picked out my faves! Thank you, Tina! Hi-big person here so of course love your pattern with pups! Hi-big “dog” person here so of course love your pattern with pups! 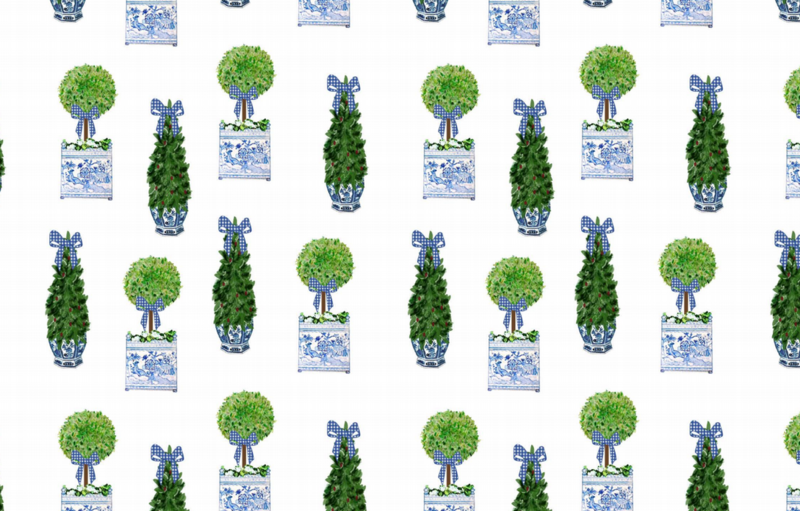 My favorite paper is the Topiaries with blue & white gingham. I love them all. What a beautiful collection of gift wrap and toppers! This is by far the most lovely gift wrap I have ever seen. I even give it as a “gift” to some family members who have everything but this!!! LOVE the ribbon this year too!! So beautiful!❤️ Love them all! My eye does go to the topiaries with red and gingham ribbon and of course the dogs. Love all the toppers. Well done, Tina. The tissue paper puts your gift wrap over the top. Well done! Topiaries with red and white ribbon. Of course the dogs. Love all the toppers. I can’t tell you how much I am in love with the adorable trees and topiaries with ribbons on top! So cute! Beautiful wrapping papers!! My favorites are 3 and 4. Most beautiful Christmas wrap I have ever seen! Tina, you have really outdone yourself with the addition of more beautiful papers, tissue and ribbons! Loving the topiaries with blue and red checked ribbon. Congratulations! 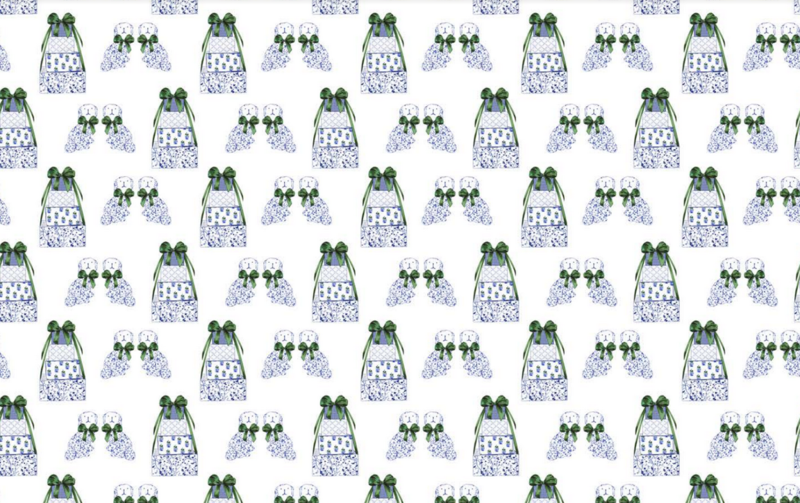 Paper 7c, -the topiaries with blue and white gingham is my favorite! I also love the toppers! Love all of them but my fave is the topiary with red/white gingham! These are beautiful! I do love the topiaries with the red ribbon! This wrapping would make every gift look elegant! They are all simply stunning but the topiaries with with the blue and white ribbon is my favorite, a very tough choice to make! Love them all, but 7c and 7d are my new favorites! Topiaries with blue and white please!!! Thank you Tina! Your brilliance of doing a blue/white/green paper can be used for Hanukkah gifts too!! 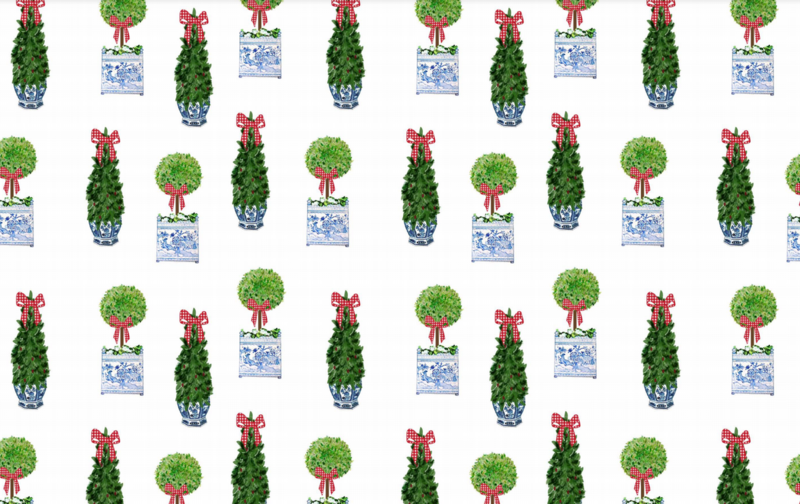 Love the topiary gift wrap – can’t wait to wrap presents!! I’ve been a lover of Staffordshire dogs for decades, so my favorite is the dogs paper. (Wish it came with red bows also). And I also love the Christmas trees in both colors! I love the topiary paper and matching tissue! I am officially excited about the holidays! Now for the gifts! Item #3 is by far my favorite. Love the topiaries with the blue gingham bows. Darling cute!!! I can’t wait to receive this gift wrap and have “The Look” under the tree this year. 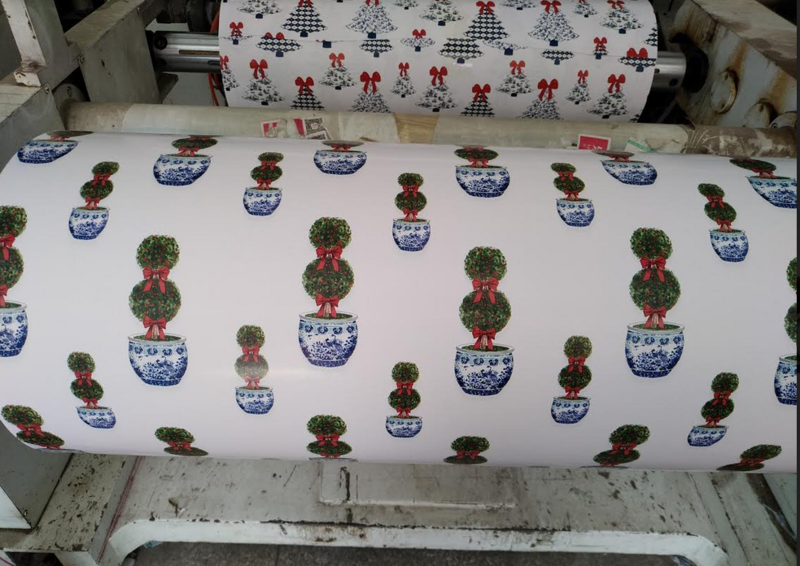 LOVE LOVE LOVE the topiary Christmas paper!!! Such a nice change from the typical choices. Happy Holidays!!! Omg!! These are all gorgeous! I love each of them. I guess if I had to choose just one, it would be the topiaries with red ribbon. They all just make me so happy! Thanks you for the lovely choices in gift wrapping. Love the blue Christmas trees with the red bows!! Love them all but the blue and green topiaries is my favorite. 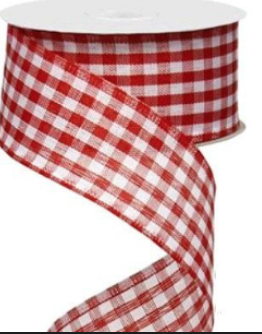 Perfect with red ribbon for Christmas and all year round with green or blue gingham ribbon. This new Topiary paper is gorgeous. So classic !! This will be a Very difficult but fun decision trying to choose the one to order. I may just order several. !!! Beautiful! I ordered some earlier because I couldn’t wait for the new designs! I love the blue trees with the red ribbons! The Christmas trees with red bows and love the ribbon! I love them all as usual! Not sure which I love more!!! Thanks Tina!!! All styles are fabulous but topiaries with red bows are my favorite! Beautiful offering! I love the Christmas tree/Topiary mix! Items 3, 4, and 6 are my favorites! Thanks for the pre-sale! Ok… I have to have the staffordshire dog and gifts! Love that pattern! It’s all beautiful, but my favorite is the green topiaries and mini-trees in the blue and white pots. The colors are so bright and make me want to get wrapping! Love your new topiaries with the red bows! And all of them really… can’t pick just one! Topiaries with red & white ribbon is my absolute favorite!! Love Everything!!!! One is just as fabulous as the next one! Blue trees with red ribbon! You are inspiring me with Christmas spirit! Luv Item 3 , 5 who wouldn’t want to squeeze the lil pups? My favorites are 3, 4 and 6! Love your blog! Item 6 and 1oB-love the puppy! The topiary patterns are all exquisite! Love, love, love all the designs – makes it hard to narrow down my choices! Wow, love all the wrap and tissue. I especially like the stacked gift boxes with green ribbon and all the tissue paper. What lucky recipients to receive gifts wrapped in these beautiful papers and tissue. Too pretty to open. The topiary paper with red gingham ribbon is my favorite!!! Love them all!! Absolutely beautiful! Ribbon! Perfect under the tree! I love all the wrapping paper,but if I have to choose one, it would be the trees with the red bows. Thank You for the giveaway. Topiaries with red and white gingham wins my ❤️ Love all of them! These are so beautiful. Maybe I should have some sent to my family so they can wrap my presents with it! :). I think my favorite is the boxwood print. Love the blue trees with green ribbon! They are all beautiful. If I had to choose 1 it would be 7C. 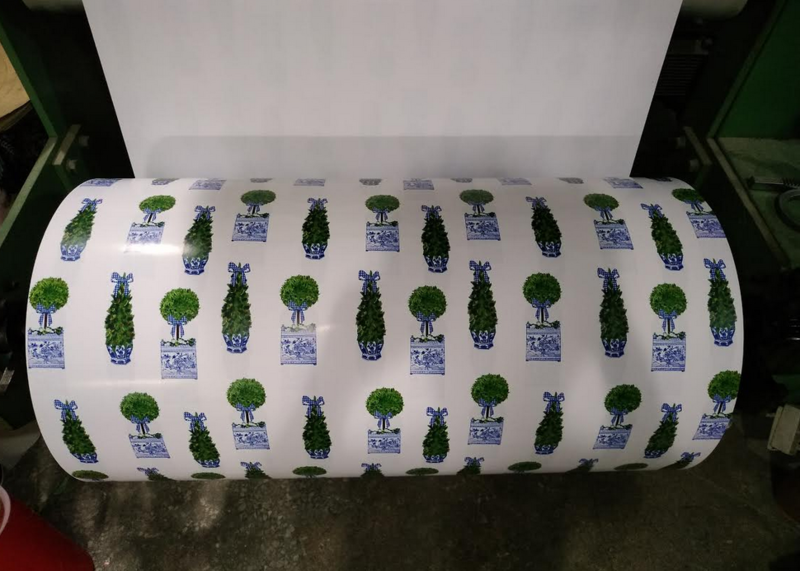 Ordering rolls of the green and navy trees…just love them!! And of course have to get the matching tissue paper to go with them!! Love the Staffordshire dogs and presents. Adorable! 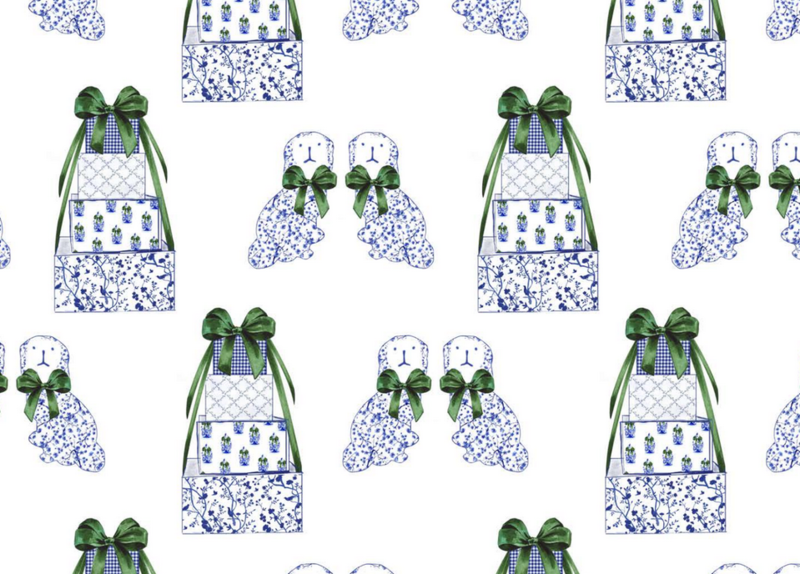 I love, love, love the luxe wrapping paper with the blue planters and two kinds of green topiaries. I can see it with the matching tissues and the beautiful green ribbon. Of course adding the decorative ornaments is the final touch. Just beautiful! They are all beautiful! My favorite is the topiaries with the red and white ribbon. It is all beautiful, but the pups. I really love them. All are gorgeous, but the paper with the Staffordshire dogs is incredible! It grabs my attention every single time! I absolutely love the gift wrapping paper with the topiaries topped with the red and blue gingham ribbon. I can just imagine presents 🎁 wrapped with it! Love the blue trees with the red bows! Topiaries with the red ribbon, matching tissue ( love! !❤️), and a topper… perfection. So lovely and just classic. SO nice to see! Love them all, yet I always go back to the topiary as my most favorite… especially the one with the navy gingham bows. What beautiful paper almost as lovely as the gifts they will wrap! So much to love! I will definitely be ordering a few reams to go with the rolls of ivory, pink and blue chinoiserie I already have. The ribbons are such a fabulous offering, and are an incredible deal, to boot. Such gorgeous papers! 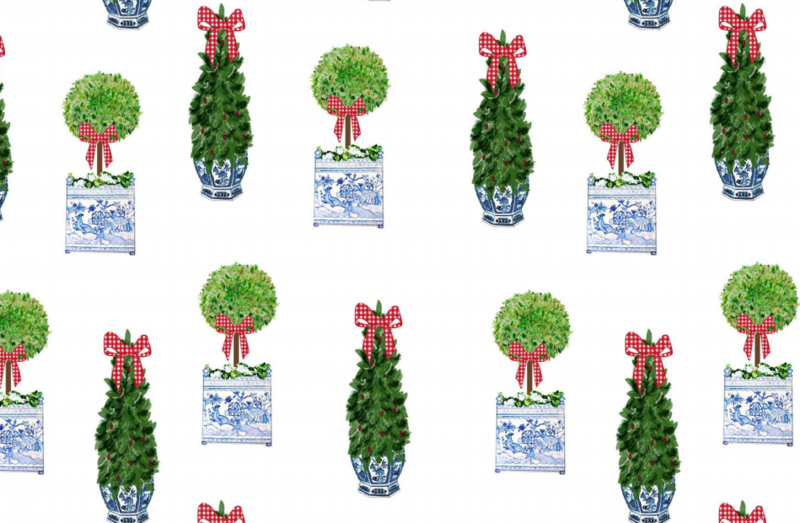 My favorites are the topiary ones, especially the ones with the blue gingham ribbons. I love the blue trees with the green bows! I adore paper #4, the topiaries with the blue gingham! I will use it all year! Such beautiful giftwrap! 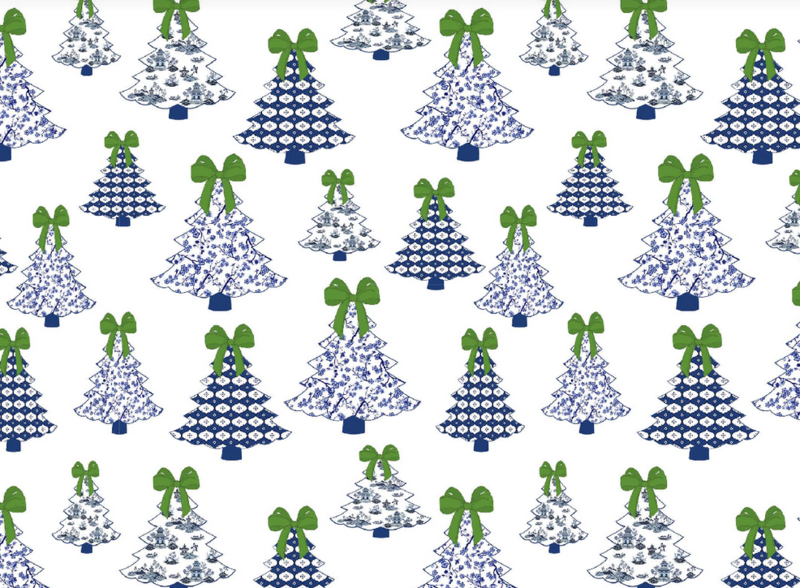 I love the topiary with the blue and white gingham ribbon for everyday, the topiary with the red and white gingham ribbon (my absolute favorite), the new Staffordshire dogs in the blue/white/green and the Christmas trees in the green and blue colors. I am totally nuts over the printed tissue paper, which I is such a gorgeous surprise when you open a box. The ribbons and tie ons you are offering this year are stunning accents! Bravo!!! What fun to see the newest Staffordshire dogs and presents paper~~classic combo! I can’t pick a favorite!!!! Love them all!! I’m a topiary girl at heart! I love both! The Staffordshire Dog Wrap is just beautiful, so unique, can’t wait to use on special gifts! It’s impossible to pick a favorite- Love them all! I absolutely love the gift wrap and the gift toppers! 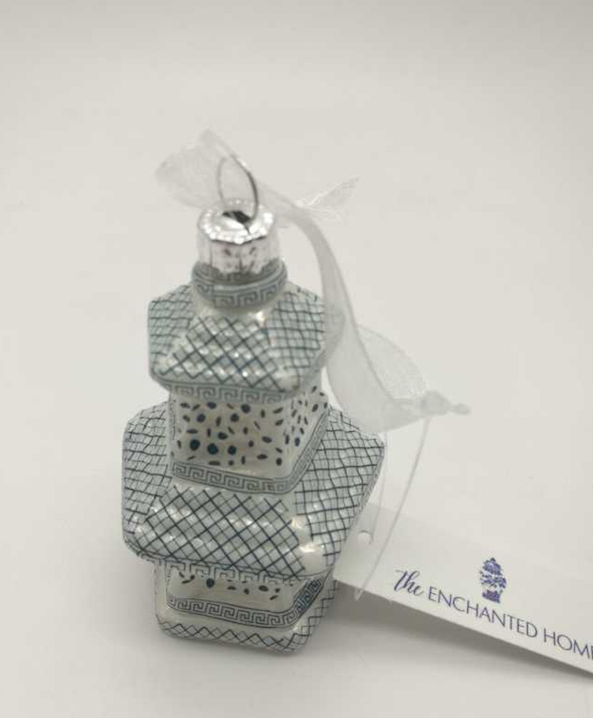 Leave it to The Enchanted Home to come up with such unique accessories to make gift giving a joy for the giver and the receiver! Thanks, Tina and team! 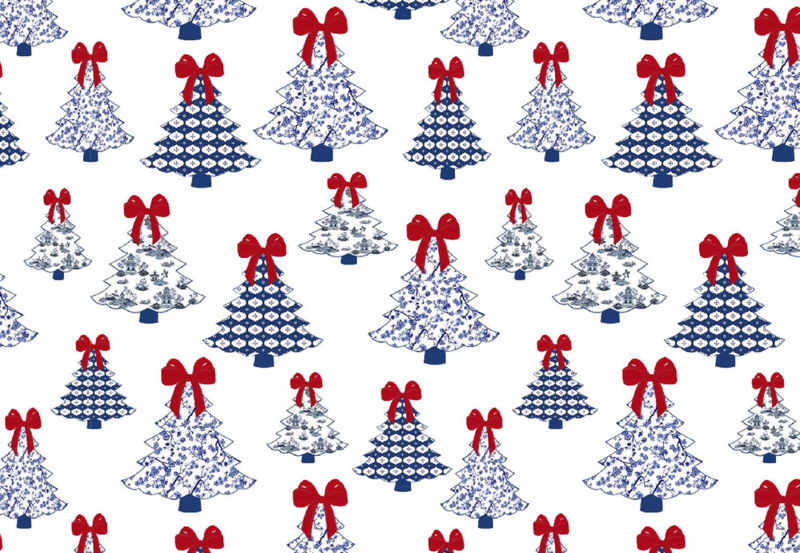 Love the blue & white trees with red ribbon & the topiaries with red gingham ribbons! Have to include a bit of Christmas red in there! The most elegant and stylish Christmas wrapping around! Loving the new topiaries with red bows and the Staffordshire dogs! Need to order these too to match my ornaments! Simply divine! thank you! Beautiful wrapping paper!!! Love it all!! The staffordshire dogs and topiaries are so cute! I love the new Staffirdshire dogs! And I can’t wait to get out the ornaments and gift wrap I ordered last year! I need two of everything 😍 You all have knocked it out of the park!! Such beautiful paper! The mixed topiaries with the blue gingham bows is my favorite, and I love that you are offering coordinating ribbon! This was hard but I’m really liking your new design – topiary paper featuring two types of boxwoods in gorgeous blue/white planters. This paper with your blue & white gingham ribbon makes my heart sing! Dreaming of a gorgeous Christmas with gifts wrapped in beautiful blue and white! I like the Christmas tree papers. My gift wrapping will be kicked up a notch. Love the topiaries with red/white gingham. All the gift wrap is simply beautiful!!! I love the topiary wrapping paper with the red ribbon. It is so classy and elegant. You have made me truly fall in LOVE with blue and white EVERYTHING! The #6 topiaries with the red ribbon are incredible!! ‘Always enjoy your choice of charm and beauty. My favorite, but oh so very hard to say just one, is the topiary with red bows. All are so pretty and the ribbon is the icing on the cake! The Staffordshire dogs are so lovely, definitely my favorite. wrapped up in these papers! I can’t wait to receive them. By far the most beautiful best thing on the holiday market! Dreamy beyond. I need them ALL! 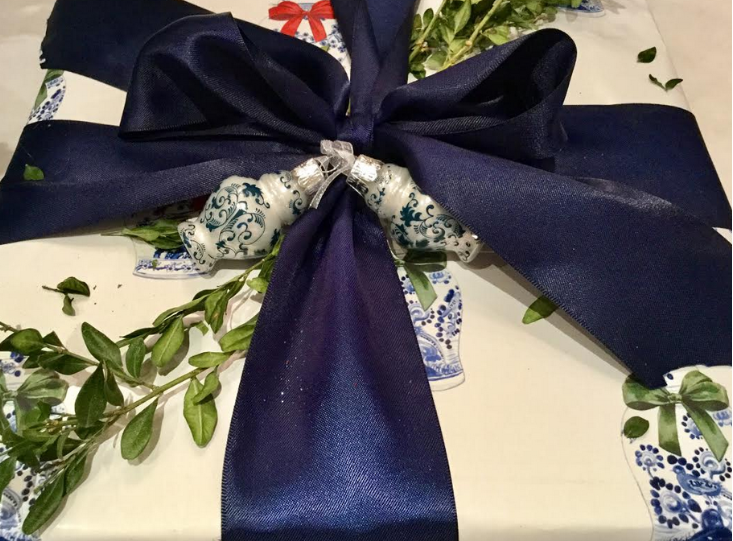 I adore Item 3 – Blue and White topiaroes with Red Ribbon is my favorite and I can’t wait to order! I love the green and blue topiary print with the red bows. It is so merry!! Love the two types of topiaries with the red gingham ribbon and the gift toppers! Love the Blue and Green for Christmas! Just love the beautiful colors and content of your papers and products. Just makes me happy!! Oh these gift wraps are so pretty. My favorite are #2 and #6. 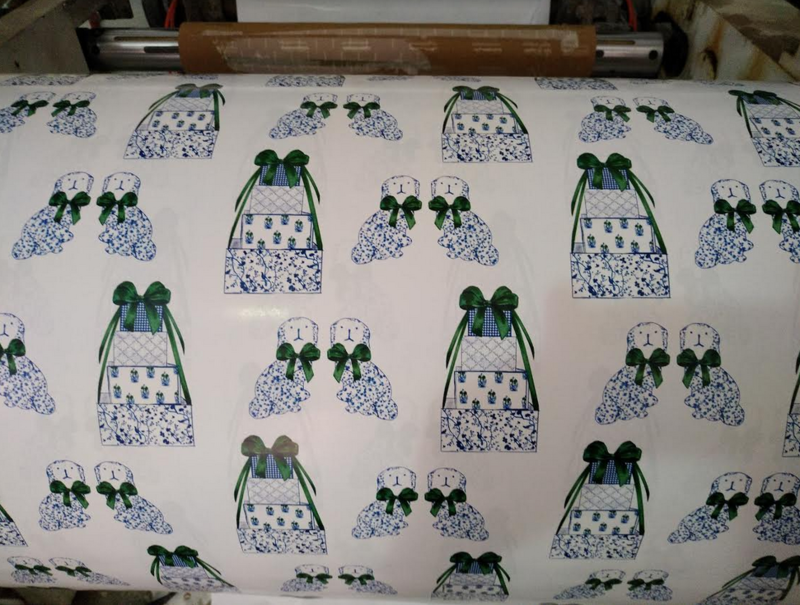 This is the MOST charming gift wrap ever! Can’t wait to start wrapping ! Although I feel your paper is the most beautiful I have ever seen anywhere, I must say number 5 is my favorite. 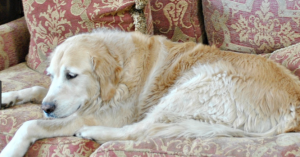 I love the Staffordshire dogs… just so so elegant…. Item 3 is my favorite. The beautiful boxwoods with the red gingham bow – what a fabulous way to top of the perfect gift! I see great looking packages going out to family and friends this year!!!! Thank you once again for great products! Love the papers, but the tissue packs with the trees and red bows will be so fun for those small special gifts in clear bags with the bows! Thank you for such fun products to reflect our love of blue and white! My gifts would look fabulous wrapped in this gorgeous paper! LOVE the topiary with gingham bow, but they are all adorable! This Is truly the most beautiful Christmas gift wrapping I’ve ever seen in my life! Thank you so much for offering it, and for your Instagram page and shop that I am in love with!! All the gift wrap, tissue paper, ribbon and gift toppers are wonderful. I bought gift toppers last year and they were a big hit !!!!!!!!!!! I will have to buy more this year !!!!!!!!!!! Love them all but the red gingham topiary print is beautiful! These are all lovely, so hard to pick a favorite! Still adore the topiary with red ribbons. Love a classic red at Christmas! Gorgeous design and color. Inspires me to wrap early so I can enjoy the gift before giving away or the mad rush on Christmas morning to see what’s inside.